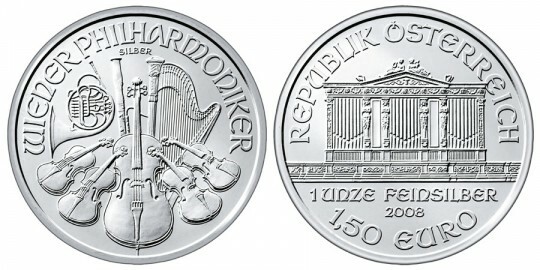 2009 marks the second year of issue for the Austrian Vienna Philharmonic Silver Bullion Coin. Produced by the Austrian Mint, the one ounce coin is 99.9% pure silver and a favorite world piece for investors and collectors alike. The coin came into being thanks to the popularity of the Austrian Philharmonic gold coin, which was introduced in 1989 and is world renowned for its beauty an investment quality. For years, the call had gone out for a silver version bearing the same design. The Austrian Mint finally acquiesced and released it to the world on Feb. 1, 2008. "A good producer listens to the market," Austrian Mint Master Dietmar Spranz said at the time. "The addition of a silver ounce to our bullion program was a quite logical step, and it once again demonstrates the Austrian Mint's competence in precious metals." Like virtually all precious metal coins, the 1.50 Euro face value of the silver Philharmonic is much less than its bullion value. Further, 1.5€ was selected due to the fact that both 1 Euro and 2 Euro are reserved for ordinary circulation coinage in Europe. "The face value of a bullion coin, however essential, is largely symbolic," Spranz elaborated. "Such coins are certainly legal tender in their country of origin, but they are never intended as means of payment. The one ounce silver Vienna Philharmonic is an investment in precious metal." With the exception of the date, the 2009 design is exactly the same as 2008's, and is a tribute to the Vienna Philharmonics Orchestra. The great organ in the Golden Hall in Vienna's concert hall (Musikverein) is the theme for the obverse side of the coin. This is the home of the Vienna Philharmonic Orchestra. Also featured on this side is the face value ("1.50 EURO"), year of issue ("2009"), "REPUBLIK OSTERREICH" and "1UNZE FEINSILBER" -- the latter two meaning "Austrian Republic" and "1 ounce pure silver." A harmonious design of musical instruments representing the world famous Vienna Philharmonic Orchestra is on the reverse side of the coin. Additionally, at top are the inscriptions "WIENER PHILHARMORIKER" for "Vienna Philharmonic" and "SILBER" for "Silver."